The Premier convenience store, in Village Lane, in Washington, was raided by a man carrying a knife late on Sunday evening. The shop worker was uninjured in the robbery but was extremely shaken by the terrifying ordeal. Police officers investigating the robbery are now appealing for any witnesses or anyone with any information to come forward. The Village Lane Store posted on Facebook: "A man entered with a very large knife demanding money and went to actually stab a member of staff. "Although our staff member was unhurt he was very shaken up . "At this time police are still investigating, no arrest has been made as yet." The offender made off from the scene with e-cigarettes and chocolate. 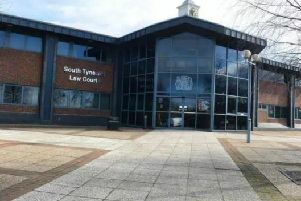 A spokesman for Northumbria Police said: "At about 9.50pm officers attended the scene where a man had entered the store with a knife, damaging the store and threatening staff. "He made off with items including e-cigarettes and chocolate. The man made off in the direction of Abbey Road. "He is described as white, medium build 6ft 2in and was wearing a blue jumper and blue jeans. "No one was injured during the incident. "Anyone who has any information about the incident is asked to contact police on 101 quoting reference 1020 140419 or independent charity Crimestoppers anonymously on 0800 555 111."